In another spurt of denier weird at WUWT, Anthony Watts from the denier blog WUWT, copied and pasted a press release about a new paper in Nature Climate Change. The paper was about warming at high altitudes. Anthony again added some words written all by himself (archived here). He seems to be taking a renewed interest in his blog. That must be about ten sentences he's written in two days. About the same number of words he's written on his blog in the past four months or so. This time the article Anthony copied is about investigations into whether or not some high altitude regions are warming faster than average. There is a difference between "seems sure" and needing "data to confirm this". 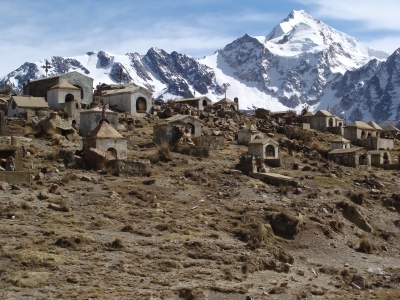 The scientists have found evidence that some high mountain regions are warming faster than lower elevations, but this needs to be confirmed. UMass Amherst’s Bradley adds that without substantially better information, there is a risk of underestimating the severity of a number of problems, including water shortages and the possible extinction of some alpine flora and fauna. Professor Bradley talks about the need for better information and the risk of not knowing. That is also some way from seeming "sure". The research was part of an effort by the Mountain Research Initiative, which you can read about here. (As a bonus there are some beautiful photographs.) It is an international collaboration funded by the Swiss National Science Foundation and hosted by the Institute of Geography of the University of Bern. This paper was co-authored by twenty-one scientists from Austria, Canada, China, Ecuador, Italy, Kazakhstan, Pakistan, Switzerland, United Kingdom, and the United States. Monitoring by surface stations, preferably with cameras attached, will provide visual information as well as metrics on temperature, precipitation etc. Satellite data allows monitoring of inaccessible regions, but has limitations such as not being able to "see" through clouds, which occur a lot over mountainous regions. They are also subject to orbital drift, which makes comparisons over time particularly challenging. The third method discussed is by modeling. Although grid size of models can mask what is happening, using downscaling, scientists can explore changes in particular regions. All three approaches will help work out what is happening and what is likely to happen as climates change with greenhouse warming. The main hurdle is getting the data, which is one of the purposes of this paper as I understand it - discussing what data is needed and how best to obtain it. Anthony Watts is a science disinformer by "profession". If there is new paper on anything vaguely climate-related, he disputes it as a default position. Only rarely does he show any sign of understanding what he disputes. Anthony doesn't seem to care that he comes across as ignorant and dimwitted. His readers don't know the difference and care even less. That's all that matters in terms of blog hits. He claims "they seem to be focused on the Tibetan Plateau". On this first point - Anthony didn't read the paper. All he saw was Figure 1: Elevation-dependent warming over and around the Tibetan Plateau. He failed to notice the list of 86 references covering mountainous regions around the world - from China, Korea, India, Nepal, Canada, the USA, Switzerland, Austria and everything in between. Anthony claims that Banff temperature " looks to be a bit cooler". At least in the broken record that Anthony came up with. 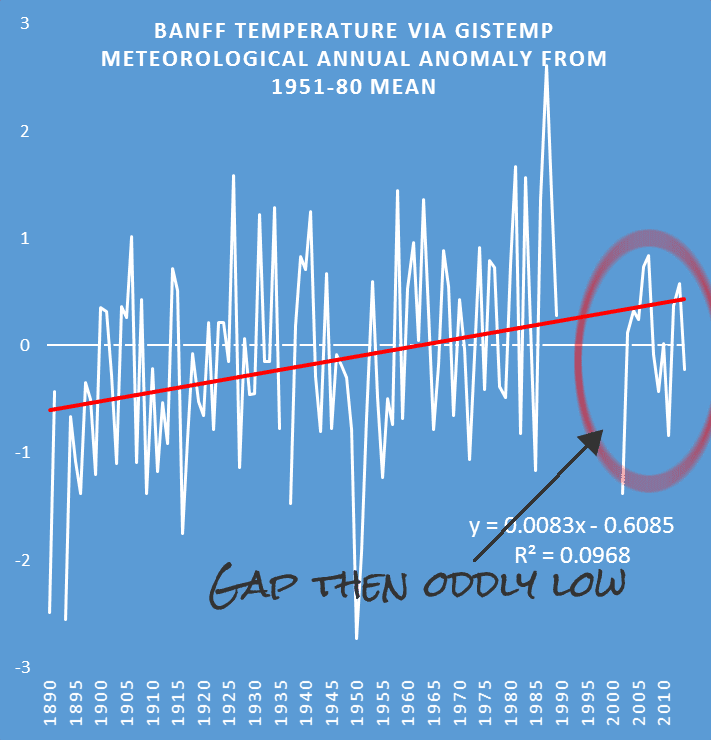 Anthony decided not to show the BEST data for Banff, because it shows that temperatures there are going up. Al Gore! Yep, drawing on the classic denierism of the "Al Gore is fat" type, Anthony claims that because Al Gore was wrong when he said that "Within the decade there will be no more snows of Kilimanjaro" it means that the mountains aren't warming! Anthony also claimed that "the snow is coming back to Kilimanjaro". He didn't mention that there have been massive declines in glaciers there. The impact of land use change is likely to be very limited, according to this paper in Nature. Chasing Anthony's squirrel - he wrote: "From what I can tell, they are using GHCN data for high elevation stations, such as the one from the Sulphur Mountain Weather Observatory, in Banf, Alberta." But he hasn't even read the paper let alone the references, so how can he claim to "tell" anything. If he'd bothered to open the Supplementary Information file, he'd have got a bit of a clue about where his "data" came from. Not only that, but does Anthony think that his Sulphur Mountain Weather Observatory, in Banf, Alberta is on the Tibetan Plateau? Remember, he claimed just two sentences prior, that the study was "focused on the Tibetan Plateau". Chasing that particular squirrel a bit further, Environment Canada isn't the friendliest website for trying to get weather data or figure out what's happened at a particular location. Could be that I just haven't learnt how to navigate it. In any case, it looks to me that there were changes to the weather stations in Banff - especially during the 1990s. Berkeley Earth agrees. Here are plots from Berkeley Earth, showing raw and adjusted records. I've just noticed that in the WUWT comments, Dave in Canmore tells Anthony that he's wrong, too. Would you agree that Anthony went looking for a station somewhere that he could claim falsified the research? Even if the temperature in Banff wasn't going up (which I doubt), would a single location mean that no temperature anywhere else could be rising? Perhaps he can tell the ski resorts in Switzerland and Austria that the melting snow (and lack of snow) isn't because it's getting hotter. Tourists are warming the Tibetan Plateau! Anthony isn't shy about looking stupid, is he. He wrote: "…one wonders if similar weather observatories in Tibet aren’t simply seeing the effects of increased tourism, resulting in land use modification." It reminds me of Anthony's UHI classic, when he claimed that a couple of people doing research in a remote part of eastern Antarctica, who shared an unheated tent - caused an "urban heat island" effect more than 3,000 km away on the other side of the Antarctic continent. Why does Anthony Watts post such utter rubbish? Anthony's typical readers wouldn't shift their thinking even if Anthony did an about-face and became pro-science. They'd just rant for a bit and then go elsewhere. Not to Judith Curry's blog because there are too many words there. WUWT-ers find reading words a bit hard going and would probably regard Judith's blog as denial that's a bit too "inti-leckshull". More likely they'd settle for some other conspiracy theory website. One that has lots of pictures, where they can post whatever random "thought" happens to be in their head at the time, and where it's unlikely that their random "thought" will be mocked by anyone else (or noticed). All of which leads me to the WUWT comments - many of which are mind-numbing. Have you got your head-vice in place? Here you go. The WUWT-ers are eager to take part in the competition for the dumbest comment. wickedwenchfan says that the scientists are stupid. Don't they know that it's cold in the mountains? And how can CO2 have an effect when the air is so thin? Stupidity in the extreme. Mean temperature drops with altitude (hint, atmospheric pressure not GHG’s is responsible for raised surface temperature) I would be surprised if any mountain above 5000m has mean temperatures above freezing or ever will. Let’s face it, even if you believe in back radiation you would have to be wondering just how many extra CO2 molecules are accumulating above that elevation to be having an impact. Patrick is another one who reckons that mountains can't get warmer. Any fool knows that mountains are cold! Oh dear lord! More models. For every 1000ft increase in altitude/elevation, there is a ~1C DROP in [temperature]! If anything they are COOL and will always be so. Charlie tries out sarcasm to let everyone know that he just knows that it's colder up in the mountains, those silly scientists don't know nuffin'. It’s amazing in Vermont generally its colder on the top of the mountains than down in the valleys. It also snows more there. I don’t know if this strange phenomenon happens on other mountains. I’ll do some research and let you know. Don’t the radiative cooling effects of CO2 increase with altitude ? EternalOptimist is a confused little WUWT-er. Yes Patrick, & that is why these studies rarely have figures showing the actual temperatures, just ones showing the anomalies. The authors are afraid that no-one would would take any notice if they said the average temperature at 4000m had risen from -x.yzC to -x.yaC. And personally, I don’t blame them for being afraid, because the differences are irrelevant in the real world. A below freezing climate is still very cold, no matter how much it has warmed relative to its prior average temperature. Don’t we already have satellites measuring temperatures at altitude globally? How come these are ignored and instead climate science relies on sparsely sited land-based thermometers, often contaminated by urban growth? It doesn’t make any sense, scientifically. Why rely on the worst possible measurements to conduct your science, while ignoring the most exact measurements? It seems to me that the “high mountains are warming faster than expected” says a lot more about the expectations of the researchers than it does about the high mountains. Thing is, of course, that satellite data is being used, as described by the scientists. 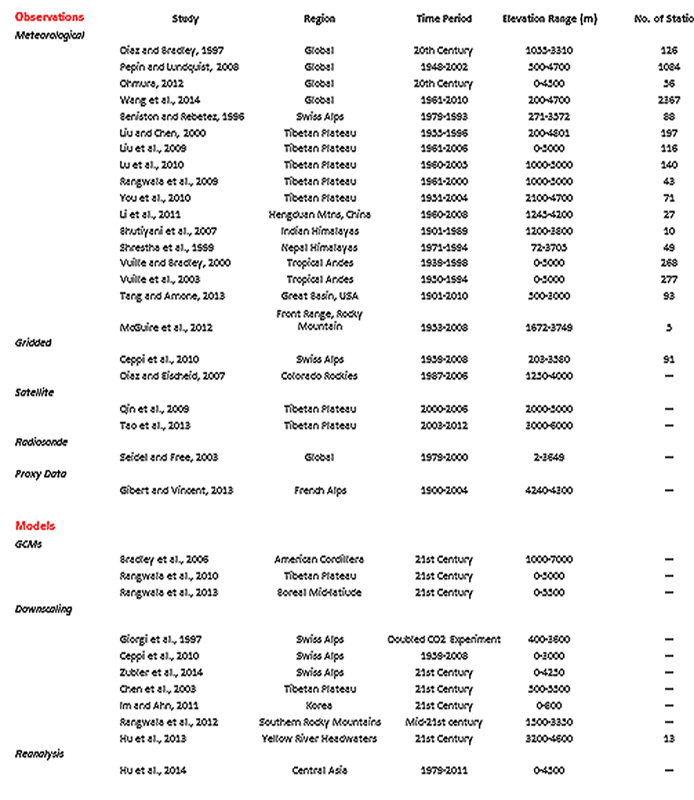 And those data are no more accurate than any other measurements and in many cases a lot more difficult to work out. And when there are clouds it gets even harder, unlike surface instruments. Anyway, Ferd's wrong comment about satellite data got a whole heap of echos from other silly WUWT-ers who didn't bother with what the paper was about, any more than Ferd or Anthony Watts. Actually Fred, I would say a big reason they pick on the high mountains is that, just like the polar regions, there are so few actual weather stations up there. The lack of real data allows the “warmmunists”, to attempt to feather their own nests by demanding more taxpayers money be spent on research into the “problem”. A real scientist would ask for more weather stations, but this mob ask for research grants instead. 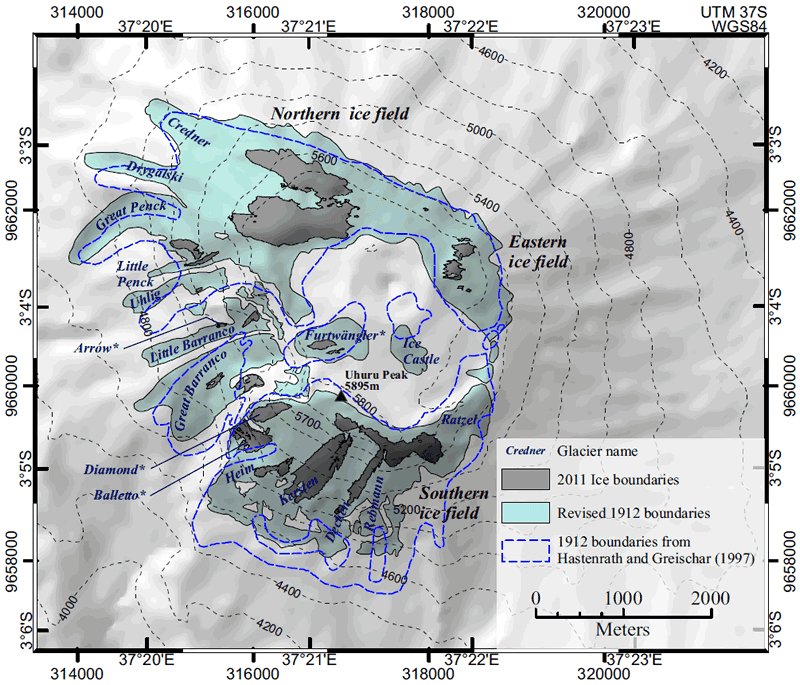 We discuss future needs to increase knowledge of mountain temperature trends and their controlling mechanisms through improved observations, satellite-based remote sensing and model simulations. Perhaps the mountains are getting lower! Someone must be cooling equally fast. Does the guy even stop to think about that. Its like Dr. Mann with his lack of medieval warming. If there was no warming, and you are claiming the warming observed was “local” then why cant you tell us where the cooling was. The bigger question is why doesnt anyone in the scientific community actually ask these guys that question. So mr Bradley, given the NCEP CFSR is one of the premier grids to measure temps out there, and showed the warming after the flip in the PDO to warm in the 80s and 90s, if what you are saying is right and the last 10-20 years there is no statistical warming, WHERE IS YOUR COMPENSATING COOLING to give credence to your worse than ever High ground disaster scenario. There's more of Joe "ice age cometh" Bastardi raving on about sunspots and plant food and the big cooling that he said was coming, over at Media Matters. Just for Joe, here is a chart I did the other day of CO2 and surface temperature - so you can go ahead and believe it! Mentioning Michael Mann is probably useful to get the readers of your stealth policy blog into a frenzy and make sure they do not think too much. A science blog would have mentioned the first author: Pepin. On a blog of real sceptics or on a blog where people really doubt the science, you would expect people to like making more and better observations. But. Well. The pure existence of mountain stations is naturally a threat to their world view where climate change is not important and not even a discussion about mitigation is necessary. It interferes with their meme that global warming is due to urbanization. So cold places cannot get warmer because they are cold? I am beginning to think that we need to step back a bit in our analysis of deniers: has it been determined that they can pass the mirror test? I initially thought the "mirror text' would be placing a mirror near their mouth to see if it fogs i.e. a test of whether they are breathing! I wonder if the WUWT commenters would pass my version of the "mirror test"? The intellectual force is weak in these ones. 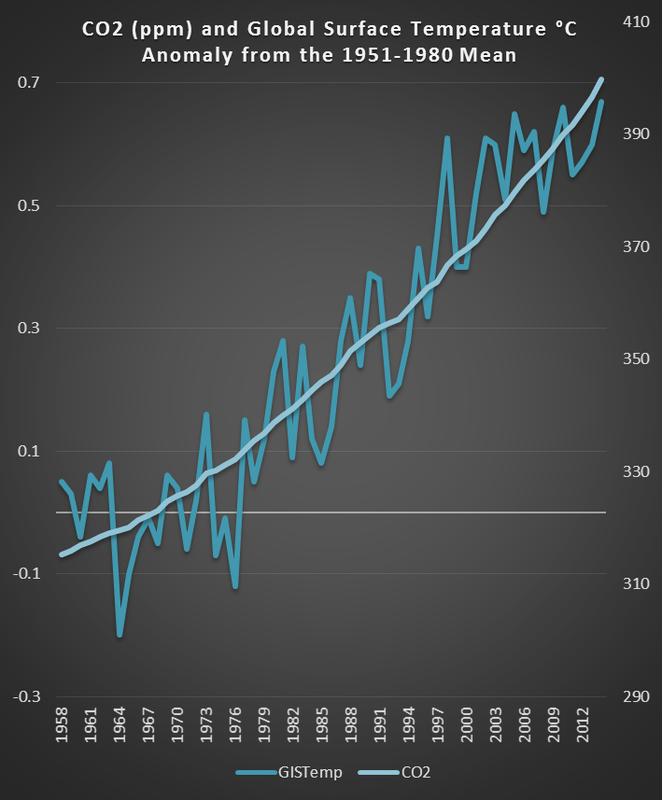 Comments like Boorman's "A below freezing climate is still very cold, no matter how much it has warmed relative to its prior average temperature." seem to be something they, and Sen James Inhofe, seem to forget every winter. Personally I'd have thought that the 'science' of the GWPF ought to have been the subject of an investigation. I just saw that too, Millicent. Did you notice that they say there is no time limit? That would be deliberate - that and seeking submissions and publishing them. The aim is to string it out, create as much doubt as possible. Only after the Paris talks are over will they show that the records are good. If they bother. The people they've appointed look to be climate science deniers - the lead is on the advisory panel and touted by CFACT etc. and he's not a climate scientist, he's a medico. Did you also notice they put up a chart of US temps not global ones - because it's the US temps that mainly have to be adjusted for TOBS. A bunch of scoundrels with not an ounce of honesty or morality between them. And what they are doing was already done by BEST. They have to know - if they possess any knowledge of the subject - that there is nothing to find. I wonder if Anthony's comatose paper will 'coincidentally' enjoy a brief reenergising for the period of the talks, just to add a second fake thread to the denial industry's campaign.